Note – OK, so I’ve been super busy and haven’t gotten a chance to finish blogging my Memphis trip – sorry! I promise to post days 4 and 5 quickly, because I have a cool blog project on the horizon for the holidays. So read on for the rest of my Memphis blogs. While I had planned out our first three days in Memphis, days 4 and 5 were pretty open. I knew I wanted to try to hit up the Memphis Food Truck Court on Sunday, but other than that, we didn’t have any definite plans for Sunday and Monday. On Saturday night, while watching the UFC fights in the hotel room, I got on the computer and started researching Memphis blues history. I discovered that one of my favorite blues musicians, Robert Johnson, was born in the neighboring state of Mississippi. His parents did not stay together long, and during his young life he moved around often, as his parents sought work on the various farms of Mississippi, such as the Abbay & Leatherman plantation in Commerce. I figured we could drive down the “Blues Highway” into Mississippi and have a look at some of the historical sites associated with Robert Johnson, then I found out that the infamous crossroads where he is alleged to have sold his soul to the devil in exchange for an otherworldly ability to play guitar was apparently only a few more miles down Route 61. That sealed it – the next day’s agenda was set! We got up bright and early, ate breakfast and headed down Route 61. 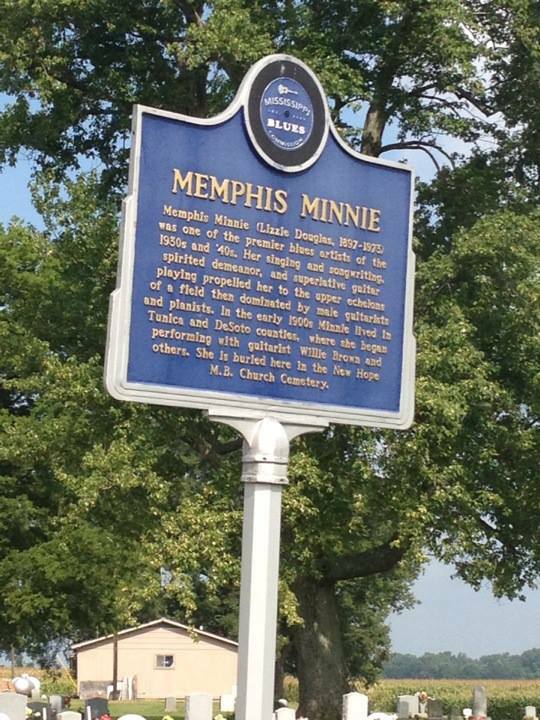 One of the most well-known female blues singers, Memphis Minnie, grew up in a town just across the state line called Walls, Mississippi. She died in 1973, and is buried in the churchyard of the New Hope M.B. Church. We started to see huge billboards for the casinos of Tunica, and after a few more miles, we came to the turnoff that leads to the casino area, which also happened to be the turnoff towards the Abbay & Leatherman plantation. 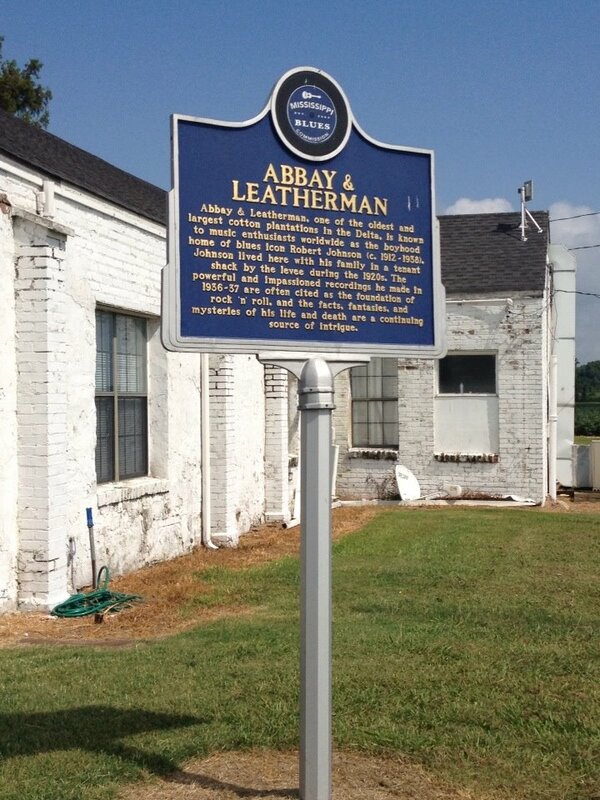 We were tempted to hit up the slot machines, but ended up deciding that we’d probably just lose money and waste time, so we pulled over at the historical marker for Abbay & Leatherman. 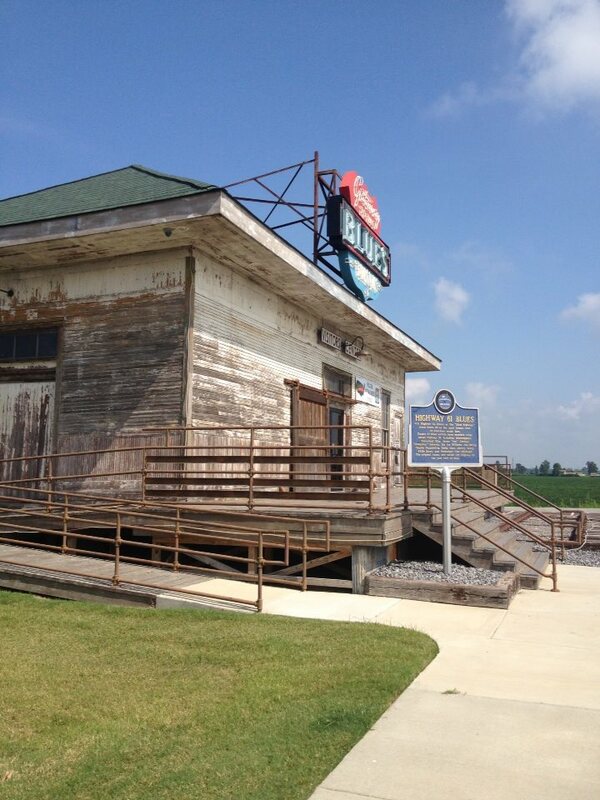 Many of the most well-known blues musicians lived on or near Abbay & Leatherman and other farms and plantations throughout the fertile delta region, leading to the term “delta blues.” During the 1920’s, 30’s, 40’s and 50’s, many blues musicians traveled throughout Mississippi, Tennessee, Arkansas and Louisiana, playing clubs in larger cities, such as Memphis and New Orleans, and in smaller towns that had only one juke joint. Some of the delta blues musicians that got their start in the region ended up migrating to Chicago or New York, taking the blues with them. 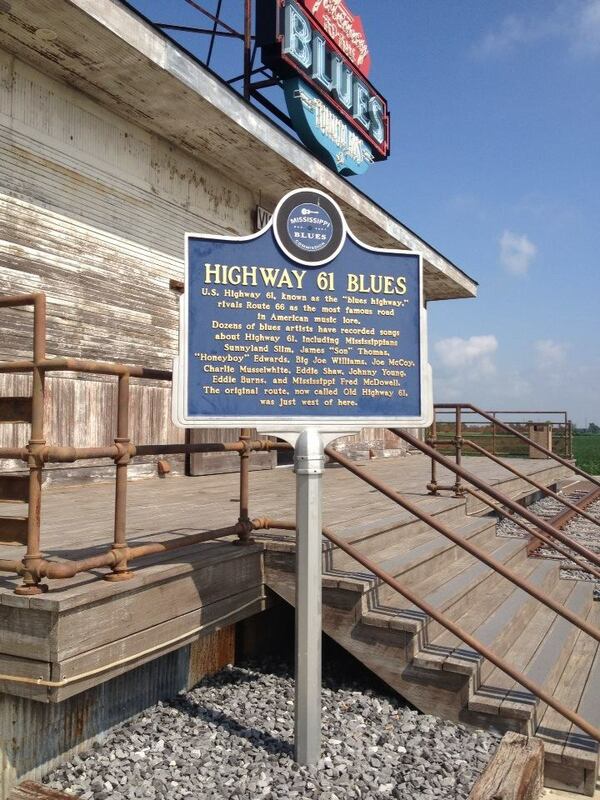 Musicians like Son House, Howlin’ Wolf, Ma Rainey and Muddy Waters all came from the Mississippi delta. The “Empress of the Blues,” Bessie Smith, met her end in a tragic car crash on Route 61 in 1937. On her way from Memphis to Clarksdale, Mississippi, with her lover, Richard Morgan driving her Packard, the pair came upon a slow-moving truck in front of them. Richard misjudged the speed of the truck and ended up swerving to attempt to avoid hitting it, but instead ended up sideswiping it. Bessie had her arm hanging out of the window on the side of impact, and she died early the next morning at the hospital, her arm having been nearly severed at the elbow and later amputated by doctors. 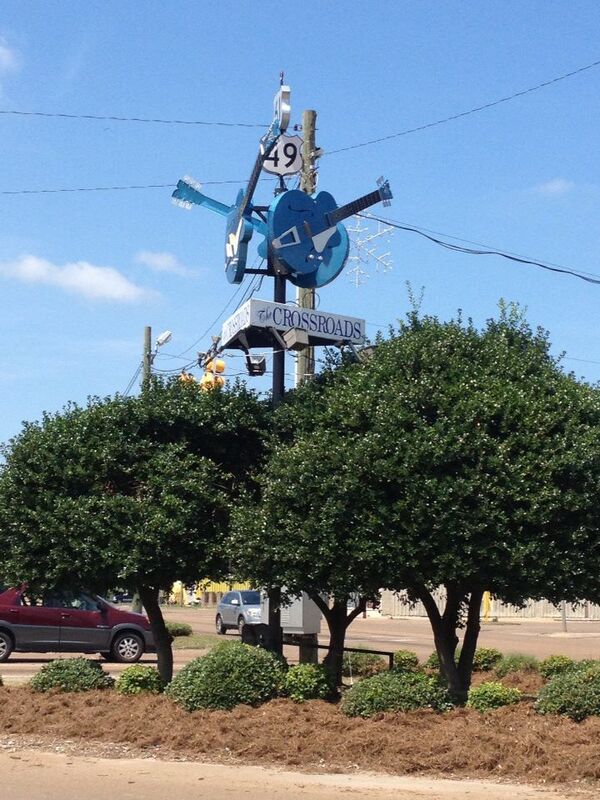 It’s nothing more than a large sign in the middle of the intersection of Route 61 and Route 49 – another Mississippi highway immortalized in songs by Big Joe Williams and Howlin’ Wolf. I’m sure the people in town thought I was crazy pulling over in the parking lot of the fried chicken joint, hopping out and running into the street to snap a picture, but maybe I could tell them I had a hellhound on my trail! After we checked out the crossroads, we made our way back up the “Blues Highway” to Memphis, passing many a dead armadillo on the side of the road (according to a friend who’s lived in the deep South, they are apparently the squirrels of the region). We ended up at Shelby Farms Park, a gorgeous municipal park on the edge of the city where the weekly Food Truck Court takes place. The park had a lake, with kayaks and paddle boats for rent, bike and running trails and a really nice lobby and welcome center. The only downside – it was HOT! Like, so hot I would have rather gone and sat in the air-conditioned car to eat, except for the fact that I’m stubborn and somewhat of a masochist. 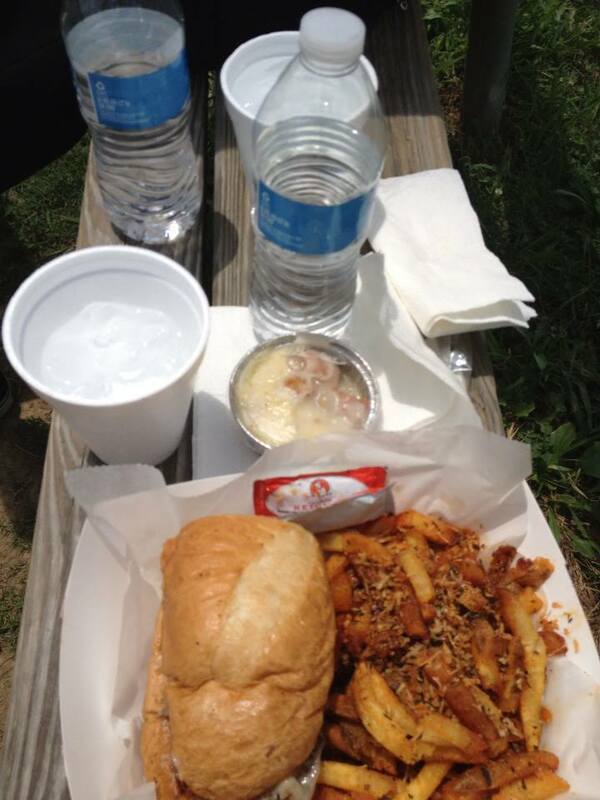 Regardless, the food was delicious! I had a yummy beef brisket sandwich, with parmesan rosemary fries and glazed donut bread pudding (which should not even be legal it was so sweet). 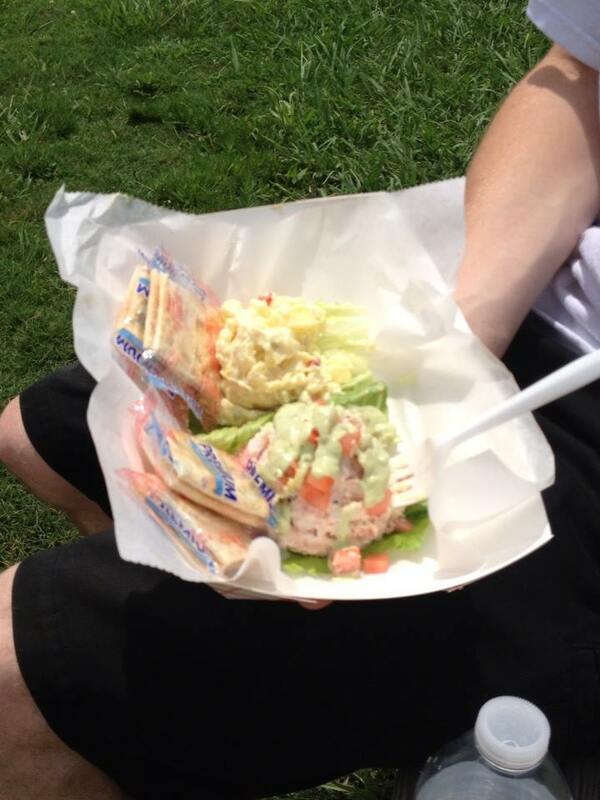 My hubby had crab salad. Everything was delicious, especially the glazed donut bread pudding! In a food coma, we headed back to the hotel and rested for a few hours, then drove back to our spot at the park by the Mississippi River to jog off some of the calories from lunch. That evening, inspired by our historical marker scavenger hunt, I wanted to hear some real blues. There are a bunch of really touristy bars on Beale Street, but the only place I wanted to be was Mr. Handy’s Blues Hall. I realize the decor may be more kitsch than authentic, but the place was awesome – laid back vibe, live blues and cheap (tall!) beers. There was a band playing when we arrived, and when they took a break between songs, a gentleman came in via the alley door and struck up a chat with the band, who knew him as one of the regulars at various blues clubs. A few words were exchanged, and he joined them on the stage with his harmonica and a song. It was pure Memphis magic. Later that night, as we headed back to our hotel, that man’s raspy voice and jangly harmonica filled my head.